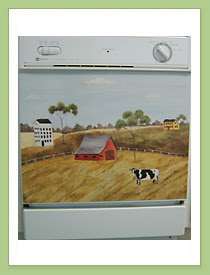 Lil' Blog and More: Review and Giveaway: Dishwasher Art. 1 Winner Ends 9/3 - US Only. 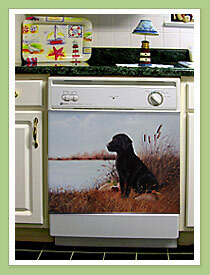 Review and Giveaway: Dishwasher Art. 1 Winner Ends 9/3 - US Only. 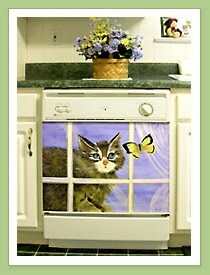 Dishwasher art is so beautiful and makes the kitchen look so much better! For my review we chose the Geranium's. Me and my grandma love them. Our kitchen is painted a light pink so you can imagine how well the Geranium's blended in. Now we don't have this plain, boring dishwasher. Normally when you walk into someones kitchen do you notice the dishwasher? Probably not. Well if you get some dishwasher art I guarantee thats the first thing people will notice. I mean, how many people actually have a dishwasher with art? The dishwasher art that I received is actually a giant magnet that sticks right on, so as you can imagine it's really easy to apply. There is also adhesive dishwasher art since not all dishwashers are magnetic. Before applying all you have to do is wipe down the front of the dishwasher with a cloth, then voila! You have a new piece of art. 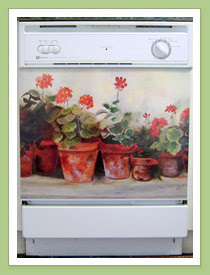 At the Dishwasher Art website you can find many different styles of art. Here are a few of my favorites..
Those are just a few, they are all beautiful though! If your looking for a way to spice up your kitchen look into getting some dishwasher art, it's so unique! Marti from the Dishwasher Art Website is letting me give 1 of you a choice of panel. I might pick French Chef. I would love to have the Barnyard Rooster! I would choose the adhesive "Let's Play" dishwasher art. My favorite is the sunflowers. I like the hugs and kisses the best. The colors match our kitchen perfect! I love the harvest one! I follow on oogle friend!